Like clockwork, the first blossoms of Trumpet Creeper appeared this week at Hilton Pond Center--a bloom date that coincides with the time when a majority of female Ruby-throated Hummingbirds begin to need copious amounts of nectar to feed their hungry nestlings. There's no doubt Trumpet Creeper's bright orange, tubular flowers loaded with sweet juice are a perfect food source for a bird that has exceptional color vision, a long thin bill, and a preference for carbohydrates--all of which provides a mutually beneficial relationship between plant and hummer. However, despite the perfect fit between a Trumpet Creeper's flower tube and the ruby-throat's needle-like bill, hummingbirds are curious creatures that find sustenance from any blossom carrying a load of nectar, so it's not surprising they will feed on flowers of any shape or color if the reward is sweet enough. Why, they even visit non-natives such as Mimosa trees that happen to explode with cotton candy blossoms at about the same time our native Trumpet Creeper blooms. 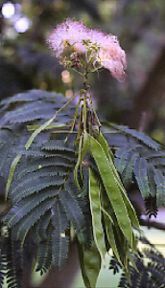 The Mimosa, Albizia julibrissin, is an oversized member of the Pea Family (Fabaceae). Mimosa, a Japanese native introduced in 1745, was among the first plants brought to North America purely for ornamental reasons. 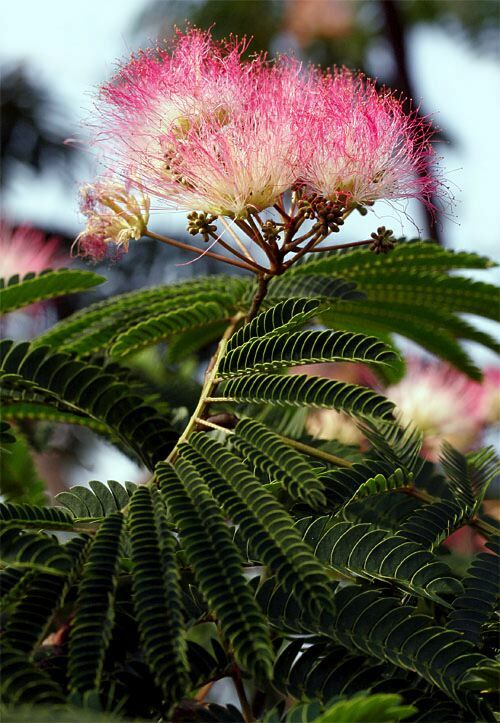 The tree's puffy pink flowers produce a pleasant fragrance and its compound leaves provide welcome shelter from the hot summer sun. Nonetheless, Mimosa--now naturalized throughout the southeastern U.S. from New Jersey to Louisiana and in parts of California--is an invasive plant that often out-competes native trees and shrubs, especially in disturbed areas and forest edges. 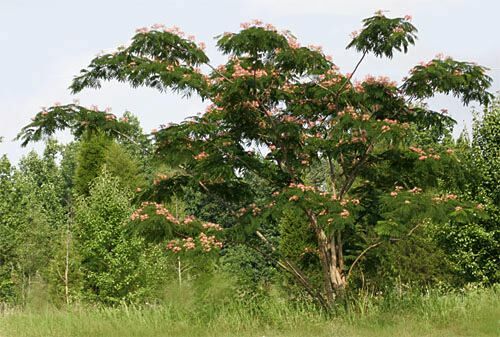 In the open, Mimosa takes on a graceful vase-like shape (below), with topmost branches forming a dense canopy that can shade out competitors, but along roadsides can form almost impenetrable thickets. Mimosa thrives in a wide range of soil conditions and often invades an area when brought in with contaminated fill dirt. Its dark brown quarter-inch seeds are protected by a hard, impermeable coat that allows them to lie dormant for many seasons--perhaps up to half a century. 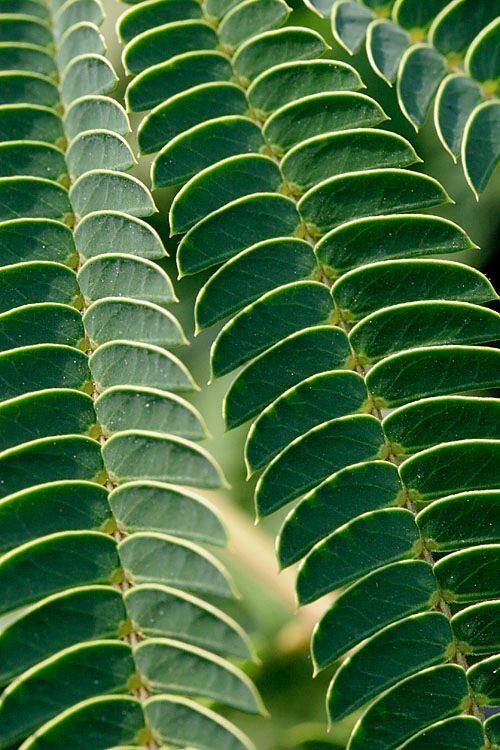 Mimosa also reproduces asexually by sucker shoots that arise from a parent tree's roots and grow to three feet in height in one year--hence the plant's ability to form dense stands in a hurry. 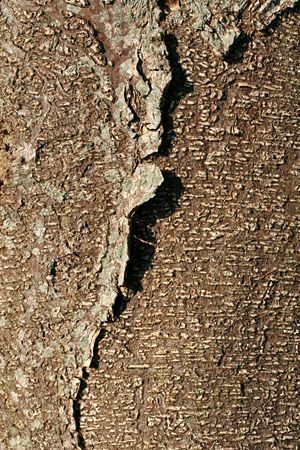 Even when a mature tree is cut to the ground, the stump often re-grows vigorously, becoming a mature tree 20-40 feet tall within ten years or so. Despite its invasive qualities, Mimosa is an attractive tree--from the relatively smooth gray-brown bark (right) to its bipinnately compound fern-like foliage (top photo and below) to those fragrant pink flowers--so much so that it is still available from nurseries and likely will continue to be planted as an ornamental wherever it will grow. 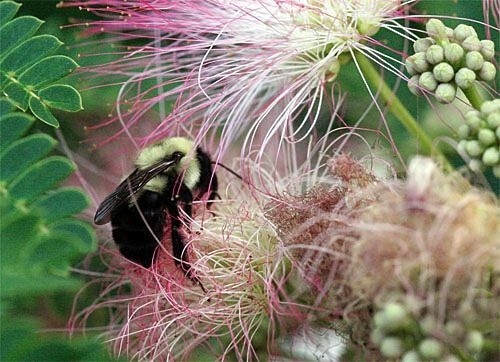 Its popularity certainly isn't hurt by the fact it's a terrific attractor of hummingbirds and butterflies--plus a diversity of bees too busy gathering nectar to worry about stinging landowners who plant Mimosa in suburban backyards. 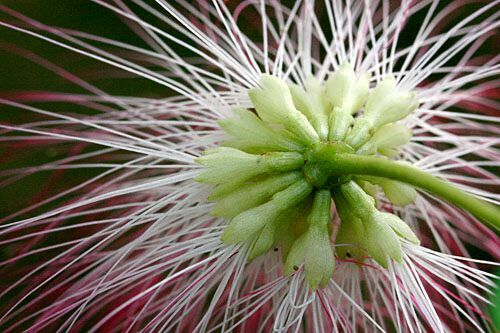 In the Mimosa, what appears to be a big puffy blossom is actually an cluster of 15-20 separate corollas, all attached at the tip of a flower stalk (below). The sepals are pale green and striped, and the five white petals are fused at the base to form an open tube. 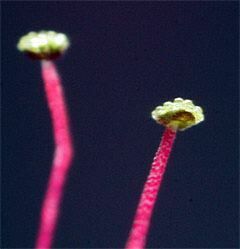 From each tube sprouts a tangle of filamentous one- to two-inch-long stamens that are white at the base and usually pale pink at the tip. 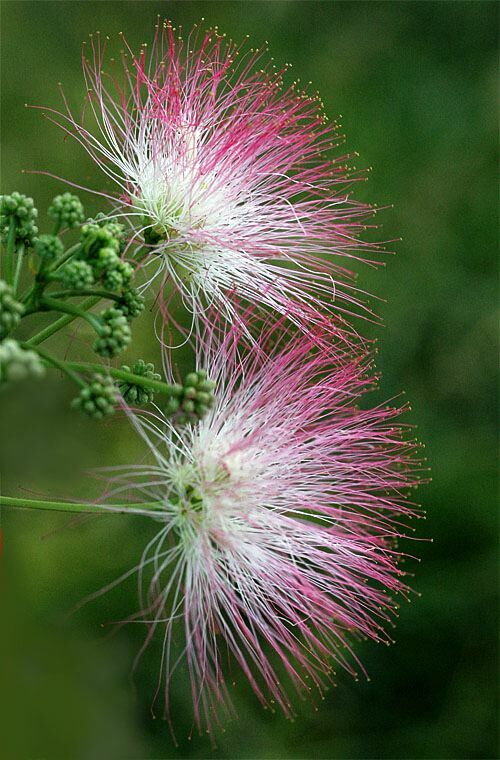 Some Mimosa cultivars have flowers that are deep red in color; we've also seen Mimosas "in the wild" whose blooms are almost white. The anthers themselves are tiny but noticeable in that they bear a dot of bright yellow pollen at the end of the stamen (below). Each flower lasts only a few days--often becoming hopelessly matted during heavy rainfall--but being replaced by new blossoms from clusters of green buds that open sequentially throughout the three-to-four-month blooming season. Fertilized flowers produce the pea-pod fruit typical of legumes; semi-succulent pods three- to seven-inches in length start out a delicate green color (left) and turn hard and brown as they ripen, each pod bearing about six seeds, sometimes more. For landowners who dislike Mimosa, it's usually because each tree is so prolific its dried seedpods litter the ground beneath, making grass-cutting and lawn-raking considerably more difficult. To be honest, we had to range away from Hilton Pond Center to take this week's photos. The only Mimosa we have on the property is a small one that ekes out a precarious existence along the road in front of our old farmhouse. A couple of times each year a highway maintenance crew comes through and mows this invasive little tree to the ground, and just as often it re-sprouts and puts forth new stems that grow a yard or so in height and produce luxuriant foliage until getting whacked back again. To our knowledge, this plant has never gotten big enough to produce any pink, nectar-laden blossoms with gold-tipped stamens (greatly magnified above right), so we'll continue to depend on our beloved native Trumpet Creeper to attract Ruby-throated Hummingbirds and Carpenter Bees around Hilton Pond. --Juvenile House Finches continue to flock into our sunflower seed traps at the Center. Most are barely able to fly, so they're not coming any great distance, but despite banding more than a hundred HOFI locally this spring we have yet to find a nest on the property. Hilton Pond Center for Piedmont Natural History is a non-profit research & education organization in York, South Carolina USA; phone (803) 684-5852. Directed by Bill Hilton Jr., aka The Piedmont Naturalist, it is the parent organization for Operation RubyThroat. Contents of this Web site--including articles and photos--may NOT be duplicated, modified, or used in any way except with the express written permission of Hilton Pond Center. All rights reserved worldwide. To obtain permission for use or for further assistance on accessing this Web site, contact the Webmaster.